Check out the first look trailer and artwork for David Gleeson’s supernatural thriller ‘Don’t Go’, ahead of its upcoming Irish theatrical release on April 12th. 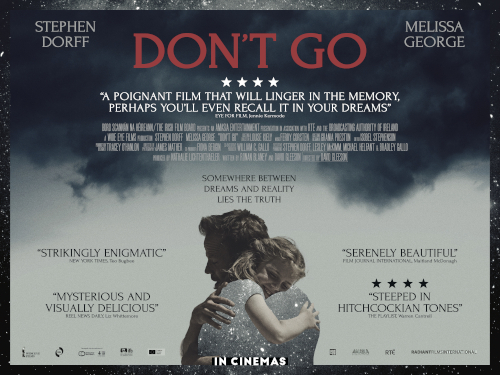 ‘Don’t Go’ stars Stephen Dorff (HBO’s ‘True Detective’, ‘Blade’, ‘Public Enemies’) and Golden Globe-nominated actress Melissa George (‘In Treatment’, ‘Grey’s Anatomy’, ‘30 Days of Night’). The film also boasts a strong Irish contingent with actors Simon Delaney (‘The Conjuring 2’, ‘Delivery Man’), Charlotte Bradley (‘About Adam’, ‘Veronica Guerin’) and Aoibhinn McGinnity (‘Love/Hate’) rounding out the cast. "Following a highly successful rollout in the US last year we are delighted to present DON’T GO to Irish audiences. A unique and unsettling experience Stephen Dorff and Melissa George are surrounded by a stellar Irish cast guiding us on a beautiful and poignant emotional journey, one we feel privileged to have the opportunity to share with audiences across Ireland." Director David Gleeson started in the film business tearing tickets in the family cinema in rural Ireland going on to make the critically-acclaimed ‘Cowboys & Angels’ & ‘The Front Line’. Alongside his mysterious thriller ‘Don’t Go’, Gleeson’s screenwriting talents will also be on display in Irish cinemas this summer with the hotly-anticipated release of the major literary biopic ‘Tolkien’. Coming to terms with the tragic loss of Molly - their only child – Ben (Dorff) and Hazel (Melissa) Slater resolve to build a new life for themselves in an idyllic hotel in the West of Ireland. Despite the stunning Galway Bay scenery, there’s no escape for the couple as the place is full of memories. Haunted by a recurring dream of a day on the beach last summer, Ben begins to realise that there are forces at work far beyond his understanding. When the boundaries between the real world and dreams start to collapse, Ben becomes convinced that it could be possible to seize his little girl from the dream. But nothing is ever so simple, and when his wife’s damaged best friend Serena (McGinnity) arrives, Ben becomes terrified that the truth will be revealed ...The truth of what really happened to his daughter. And as his grasp on reality begins to slip – as those around him begin to question his sanity – Ben becomes more determined than ever to solve this mystery and finally bring Molly home. A determination which pays off as the pieces of the puzzle slot into place, giving Ben everything he ever wanted. But at a terrible price. ‘Don’t Go’ releases in Irish cinemas nationwide on April 12th.